A slim 3mm heavy ladies' ring, crafted into a D Shape using beautiful 18ct yellow gold. Makes for a classic wedding band or versatile ring for everyday wear. 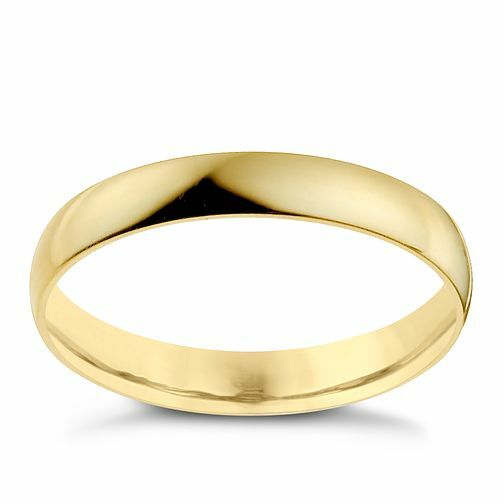 18ct Yellow Gold 3mm Heavy D Shape Ring is rated 5.0 out of 5 by 2. Rated 5 out of 5 by Anonymous from Lovely My wife needed a new wedding ring as her finger is slightly bigger which makes wearing her old ring uncomfortable. So she asked for a new ring for Xmas she picked this one in store but they didn't have it in her size so ordered online. She is very happy with it and yes you have guessed it she had to have it early. Would highly recommend. Rated 5 out of 5 by Anonymous from This ring is just what I wanted. This plain slim ring matches beautifully with my existing engagement and eternity rings. The price was over £100 less than quoted in a small independent jewellers for the same ring. Very pleased .